Video connectors are electrical connectors (or optical connectors) which carry video signals. ConceptDraw DIAGRAM diagramming and vector drawing software supplied with Audio and Video Connectors Solution from the Industrial Engineering Area of ConceptDraw Solution Park offers powerful tools for designing configurations of video connectors for different video devices. The most useful tool which provides Audio and Video Connectors Solution is Audio and Video Connectors library with 88 vector objects of video connectors and also audio connectors. It is convenient to use ready connector objects for drawing video schematics - simply drag needed of them from the library to your document and arrange in the desired way. 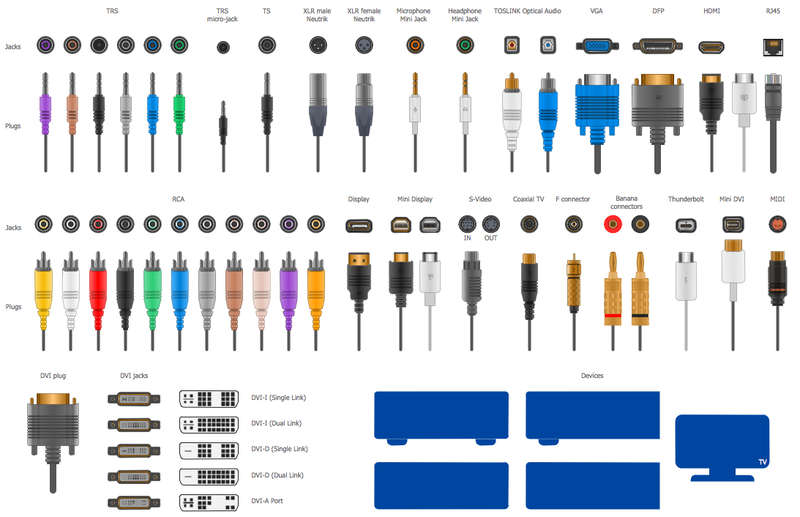 Pay also attention for the collection of examples and samples included in Audio and Video Connectors Solution, and also for the ready-to-use Hook Up Diagram template. Filling of template using the predesigned objects from the library is the easiest way of drawing. The video schematics you see on this page were created in ConceptDraw DIAGRAM software using the video connectors symbols from Audio and Video Connectors library of Audio and Video Connectors Solution. An experienced user spent 5-10 minutes creating each of these samples. Use the Audio and Video Connectors Solution for ConceptDraw DIAGRAM software to create your own professional looking video and audio diagrams of any complexity quick, easy and effective.